Downtown: Photographs contains historic photographs of downtown Birmingham that have been housed in the BPL Archives Department. 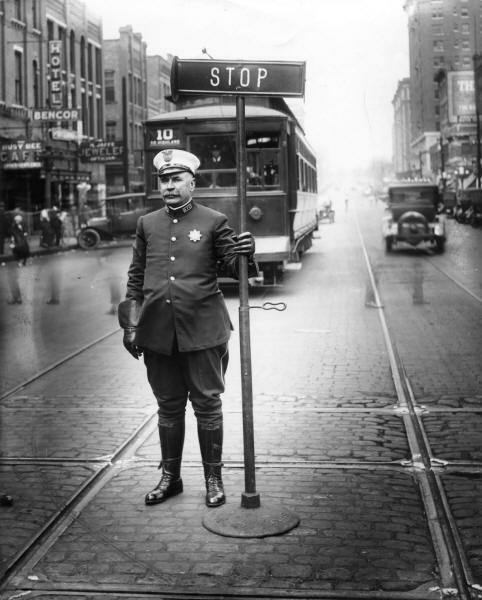 This display of vintage photographs will allow visitors to explore four Birmingham streets as they appeared in the past: Second Avenue North, Fourth Avenue North, 19th Street North, and 20th Street North. This exhibit, which will be open to the public during Central Library's operating hours, originally was on display at BPL 25 years ago. 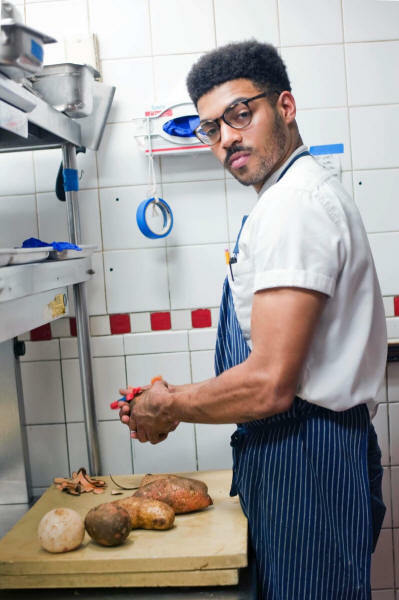 A Portrait of Birmingham at Work is a 20-portrait collection highlighting Birmingham restaurant labor, created by Birmingham photographer Celestia Morgan and commissioned by the Southern Foodways Alliance. Morgan says the food photos were inspired by growing up watching her mother cooking in kitchen. The photographs focus on the meticulous care in mixing ingredients that goes into preparing nourishment for others. The Southern Foodways Alliance, a Mississippi-based organization, commissioned Morgan to create the photo exhibit showcasing the role workers play behind the scenes and in public of producing food. Before the exhibit opens at the Central Library, A Portrait of Birmingham at Work will make its public debut during the alliance's 2019 Winter Symposium: Food is Work, being held Saturday, February 9, at Haven, an event center in Birmingham. "Libraries are our best community resource for facts and news and continue to provide critical spaces for constructive dialogue," Barrett said. "With local partners including Alabama Center for Architecture, Birmingham Museum of Art, Ground Floor Contemporary, UAB Institute for Human Rights, and dozens more statewide, it's an honor to partner with For Freedoms to present this exhibition." For additional information about For Freedoms, visit www.forfreedoms.org and follow the 50 State Initiative on Instagram and Facebook. For Freedoms was founded by artists in 2016 as a platform for civic engagement, discourse, and direct action in the United States. The exhibit was inspired by Norman Rockwell's 1943 paintings of the four universal freedoms articulated by Franklin Delano Roosevelt in 1941â€”freedom of speech, freedom of worship, freedom from want, and freedom from fear. For Freedoms uses art to deepen public discussions of civic issues and core values, and to clarify that citizenship in American society is dependent on participation, not ideology. The 50 State Initiative (including Washington D.C. and Puerto Rico) is the largest creative collaboration in the history of this country, with For Freedoms' 200-plus institutional partners bringing together artists and community leaders across the country through exhibitions and town hall meetings, and public billboard projects. 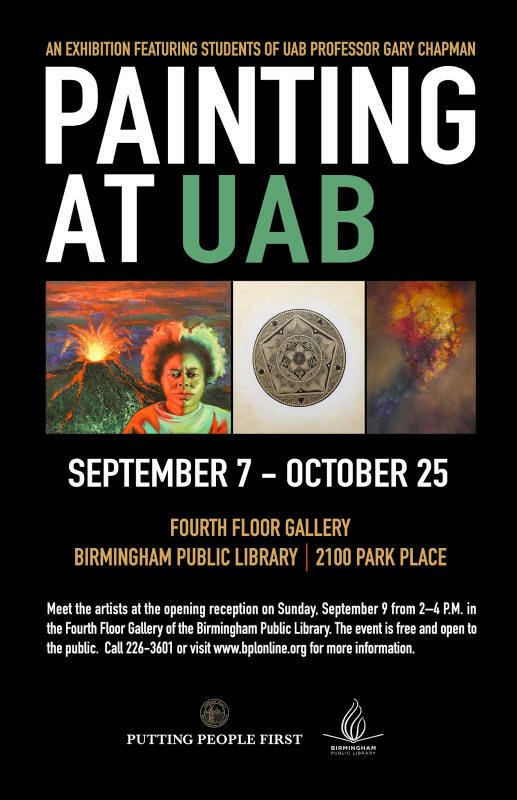 Painting at UAB, a free exhibit featuring paintings created by students of University of Alabama at Birmingham (UAB) Professor Gary Chapman, will be on display in the Fourth Floor Gallery in the East Building of the Central Library beginning September 7 through October 25, 2018. An opening reception is scheduled for Sunday, September 9, from 2:00 to 4:00 p.m., in the gallery. The exhibit will highlight the diverse work created in the UAB College of Arts and Sciences Department of Art and Art History painting studio under Chapman's guidance. Chapman said the entire exhibit is from current and recently graduated students of painting at UAB, mostly fine arts majors. Each student will have two to three paintings in the show, and two artists will have a larger display of their work. "What I am most proud of my students at this, the advanced level, is the diversity of style and subject matter," Chapman said. "There is a prevalence of figurative work, primarily because it was the subject of a recent class. But the show includes work that is abstract as well as geometric patterning." Chapman said his objective as their professor is to first teach them "the language of paint and to learn to command that language. Then the fun begins in challenging them to find their own vision for what to do with that language. I am very proud of this group of student/artists." Participating students are Bailey Barrow, Laura Benson, Ashlee Boren, Leah Cox, Becky Delgado, Frances Drew, Caroline Etheridge, Timothy Harstvedt, Cima Kahdemi, Meghan Malone, Joni Moore, Lanette Blankenship, Emily Stroud, Anthony Smith, and Daniel Vann. For additional details on the Painting at UAB exhibit, visit www.uab.edu/cas/art. For information on Chapman, visit https://www.uab.edu/cas/art/people/faculty/gary-chapman. 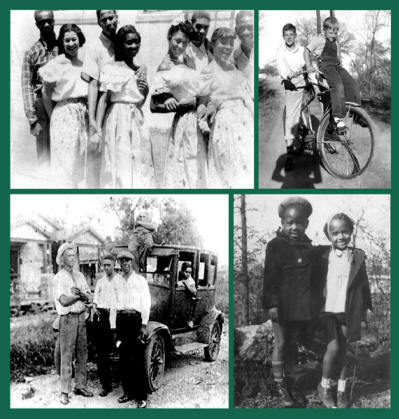 One of the Birmingham Public Library (BPL) Archives' most popular exhibits, Common Bonds: Birmingham Snapshots, 1900-1950, will again be on display in the Central Library's Fourth Floor Gallery. Including almost 300 images from the Archives' collections and private collections, the exhibit highlights the simple snapshot photos that preserve a moment, tell a story, and record life's milestones. Snapshots illustrate the common bonds of people creating their own visual biographies-mothers chronicling their children's growth, young men and women proudly leaning against automobiles, families playing in snow, friends being goofy. 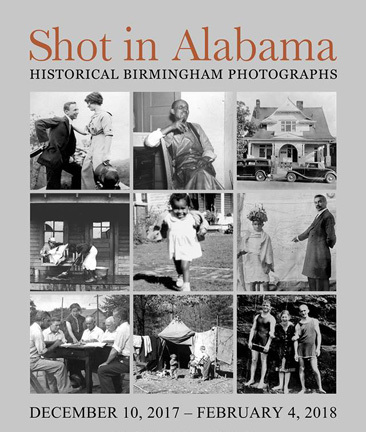 And for Birmingham, a place often remembered for its divisions, snapshots show the common interests, affections, and aspirations of people-black and white, wealthy and not-who shared far more than even they realized. The Shades Valley Camera Club (SVCC) was organized in 1954 and is one of the oldest in the United States. 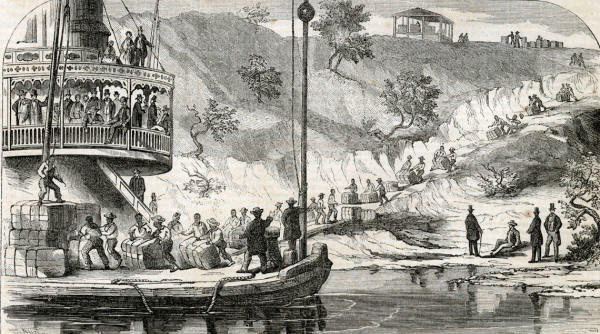 The club was established for the purpose of sharing the fascinating hobby of photography through knowledge, competitions, workshops, field trips, and fellowship. 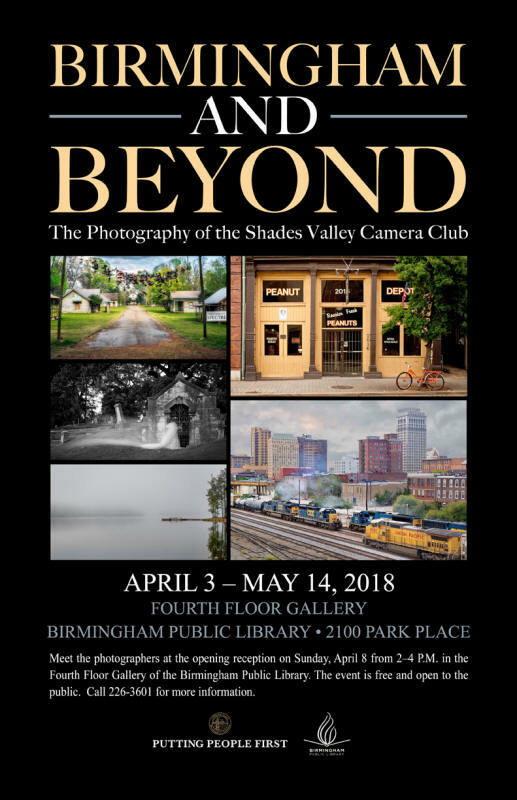 From silent rivers to flowing waterfalls, from baseball fields to iconic civil rights landmarks, from historic architecture to industrial scenes, this collection represents the diverse SVCC membership and their vision of the theme "Birmingham and Beyond." Opening Reception, Sunday, April 8, 2:00-4:00 pm, 4th Floor Gallery. The event is free and open to the public. 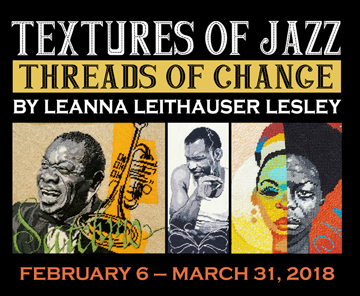 Textures of Jazz is a 25-piece jazz portrait exhibition by Birmingham artist Leanna Leithauser Lesley in honor of Black History Month. Her collection of jazz needlepoint portraits are accompanied by biographies explaining the role each musician played in jazz history, American history, and civil rights history. The exhibit will feature two workshops by the artist with live music in Central Library's Atrium. 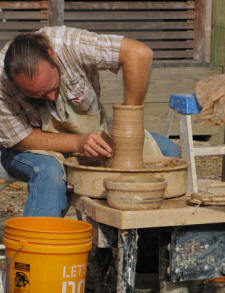 Workshops: February 14 and February 15, between 11:00 a.m. and 4:00 p.m. Live music too. An exhibit from the collections of the Birmingham Public Library Archives titled Alabama Illustrated: Engravings from 19th Century Newspapers, features images of Alabama people, places, and events that appeared in national and international newspapers from the 1850s to the 1890s. Gallery tour with BPL Archivist, Jim Baggett, Sunday, December 10, 2017 at 3:00 p.m. The event is free and open to the public. The exhibit, Blood Divided: The Story of Dr. Charles R. Drew, will be open from Friday, October 20, through Friday, December 1, 2017, in the First and Fourth Floor Galleries of the Central Library. 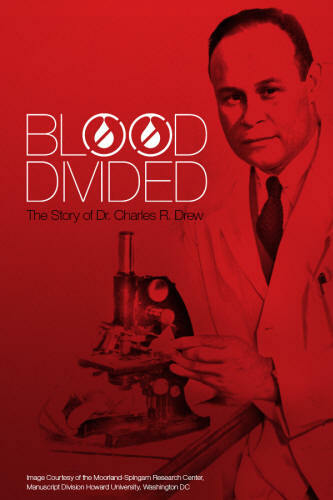 One side of the exhibit will highlight the life and accomplishments of Dr. Charles R. Drew, the blood banking pioneer who could not donate blood because he was African American. The other side is a timeline of blood science and stigma throughout history and today. Blood Divided is part of One In Our Blood, a comprehensive, city-wide program of events and exhibitions conceived and coordinated by Birmingham curator Paul Barrett, building on the work of Blood Equality. Blood Equality was launched in 2015 in partnership with Gay Menâ€™s Health Crisis, FCB Health, and artist Jordan Eaglesâ€™ Blood Mirror project to address discrimination against prospective LGBTQ blood donors and allow everyone an equal opportunity to donate blood. "We're very proud to partner with GMHC and Jordan Eagles as we further our commitment to highlighting issues of blood equality through our work," said Rich Levy, Chief Creative Officer, FCB Health, the New York agency handling the campaign. "True to our Never Finished principle, this creative partnership lends us an important opportunity to challenge the discrimination based on outdated stigmas around blood donation by building equity for donors, influencing long-term behavior and leaving behind a positive impact." 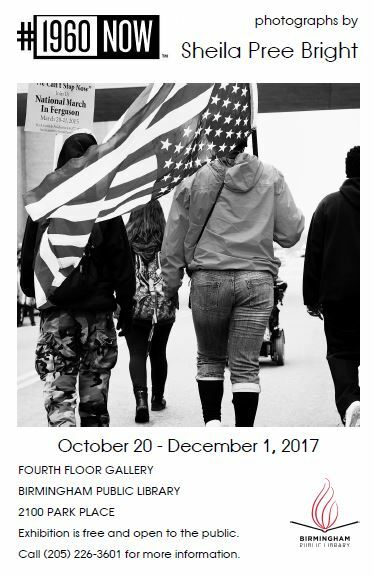 #1960Now is a photography exhibit by Sheila Pree Bright who compares current civil rights protests by young millennials and groups such as Black Lives Matter to the 1960s civil rights movement. The exhibit is a collection of her works that have appeared in the Smithsonian National Museum of African American History in Washington D.C. and two venues in Atlantaâ€”High Museum of Art and the Center for Civil and Human Rights. "It seems an impossible task to write one statement for two artists. While we share a subject-the Italian landscape-our eyes, emotions, motivations, experiences, and even our equipment differed. 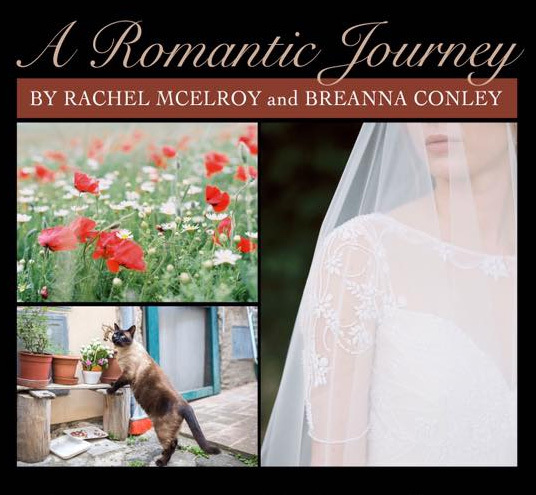 For Bre, her collection of photographs encapsulates A Romantic Journey. She experienced Italy with her husband and best friends, while also photographing Tuscan weddings. Her images reflect the Italian fairytale-beautiful brides, sparkling wines, and rainbows over golden landscapes. For me, however, I embarked on my Italian adventure after facing heartbreak. Viewing Italy through my lens transported me from the pain. Photographing felt like meditation-it was incredible, and seemed to heal me. The magical Light, the vibrant city-life, new friends, the powerful Dolomites, the poppy fields, the wine, the best pasta ever... In a way, I guess, I also experienced A Romantic Journey. Opening Reception, Sunday, September 10, 2:00-5:00 pm, 4th Floor Gallery. The event is free and open to the public. 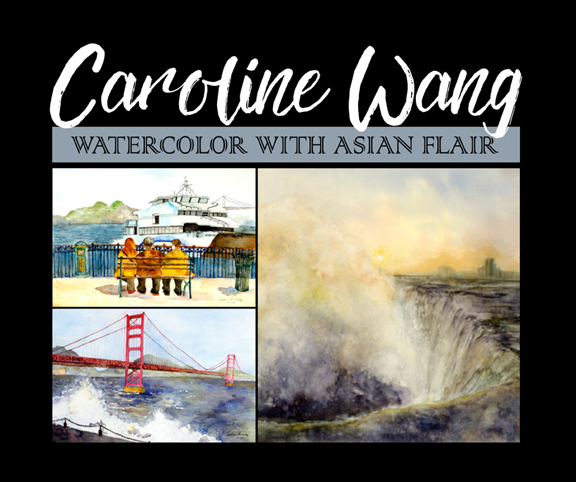 Watercolor with Asian Flair, assembles original watercolors of landscapes that Wang has encountered during her travels in the United States, the Far East, and Europe. Her watercolor paintings employ Asian brush strokes while retaining a Western visual perspective. Wang has won numerous awards at state and regional art contests. Another collection of Caroline's work, Wild Lives in Color is currently on exhibit at the Decatur Carnegie Visual Art Center from June 27 to August 5. A fashion designer as well, Wang uses her watercolor designs for VIDA scarves. She was one of the featured designers at the Alabama Fashion Alliance Fashion Show. Her other passions include violin, tennis, and public speaking. She has given many speeches to organizations and schools as a member of Toastmasters International. Through her artwork and speeches, Wang conveys one message: follow your passion and explore all the possibilities. Opening Reception, Saturday, July 8, 2:00-5:00 pm, 4th Floor Gallery. The event is free and open to the public. 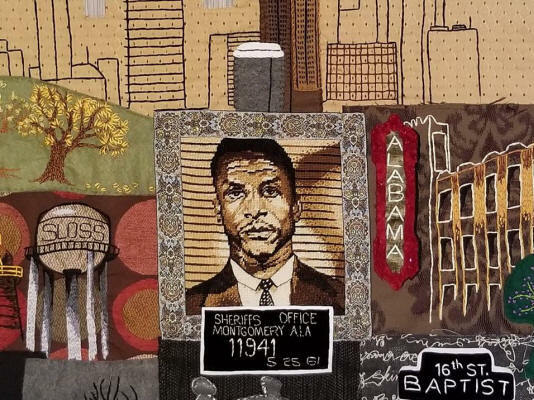 Featuring quilts by master artists from Gee's Bend and works by Miller's Pottery of Brent and Ham Pottery of Selma, the Sewn and Thrown: Traditional Quilts and Folk Pottery from Alabama's Black Belt exhibit presents two living traditions of the region. Acclaimed nationally and internationally, the Gee's Bend quilters are continuing the tradition through their families and community. Sixteen quilts by different women, some of whom are exhibiting for the first time, represent the amazing colors and innovative techniques often associated with the textiles produced by several generations over the years. Folk potter Steve Miller and his cousin Allen Ham grew up working alongside Steveâ€™s father, Eric Miller, in the workplace and shop on Highway 5 in Bibb County. Featured in documentary films, books, and articles, they represent a business dating to the 1850s that began on the Eastern Shore of Mobile Bay. Today, they use local clay to make and produce glazed stoneware, utilitarian items, face jugs, and other works of art that are sought after by collectors. For more information about regional quilting and pottery, visit the Alabama Folklife Association website. Opening Reception, Saturday, May 13, 3:00-5:00 pm, 4th Floor Gallery. The event is free and open to the public. Sweet Home: Alabama's History in Maps is an exhibit presented by the Birmingham Public Library in celebration of Alabama's bicentennial. 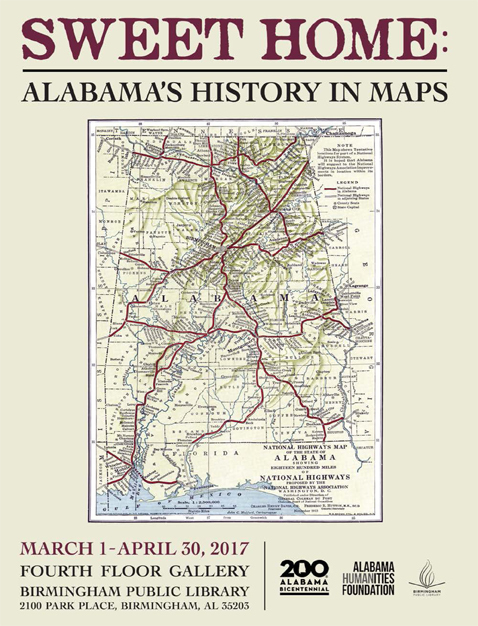 The Library's Southern History Department has carefully selected over 50 maps from our world class collection to tell the story of Alabama. The maps in this exhibit represent 450 years of exploration, expansion, and development. The Birmingham Public Library has been the grateful recipient of several large collections of rare, valuable, and exquisitely drawn maps. These donations were made by Birmingham natives Rucker Agee, John C. Henley III, Dr. Charles Ochs, and Joseph H. Woodward II. As a result of their generosity the BPL has an extraordinary map collection, the like of which is rarely seen outside of academia. Map collectors and enthusiasts have long known that maps are much more than navigational tools. They tell a story, promote an agenda, and tantalize our imagination. Maps, like any historical document, are products of their time and their creators. In the hands of a gifted cartographer, they are works of art without compare. By studying historic maps of Alabama, we gain insight into not only the physical changes of our state over the course of its history, but also into the constantly changing perceptions of who we are and who we want to be. Enjoy this exhibit that tells our story which, while not always pretty, is still ongoing and being written by all of us. Opening Reception, March 5, 3:00-5:00 pm 4th Floor Gallery. The event is free and open to the public. Programs are free of charge, but registration is requested. To register, contact the Southern History Department of the Birmingham Public Library at 205-226-3665 or askgenlocal@bham.lib.al.us. This project is supported by a grant from the Alabama Humanities Foundation, the state affiliate of the National Endowment for the Humanities. In the 20th century, Americans used the power of state and national governments to erect a network of roads and highways that made our current transportation system possible. This presentation uses maps from the Rucker Agee Collection of the Birmingham Public Library to discuss this small but important part of the national Good Roads Movement of the early 1900s. Do old maps enchant or intimidate you? Do the symbols intrigue or confuse you? This hands-on workshop explores the symbols and mapping conventions used on 19th and early 20th century maps to tell the story of the development of the Southeast. Maps used in the workshop are drawn from the Birmingham Public Library Cartography Collection. Students will learn how to interpret and analyze information contained on old maps as well as look for hidden meaning behind what was mapped and what was left off the map. Another Perspective: Artwork by E. Bruce Phillips, Jr. 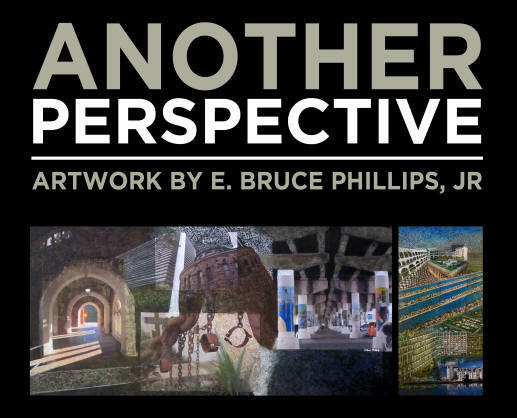 The artwork of E. Bruce Phillips, Jr. is an exploration of the connection between humans and the environment as reflected in man-made structures. He is known for use of circles, straight lines, and what Phillps calls his own "curvilinear markings" as a form of artistic expression. Phillips' newer works include photography and seek to capture the distinctive style and architecture in downtown Montreal or New Orleans, and the gritty crumbling buildings and bridges of American industrial cities. Before becoming an art professor at Tuskegee University, Phillips held positions as director of the Chastain Arts Center & Gallery in Atlanta, associate professor of art at the Atlanta Metropolitan College, and director of community outreach at SCAD, another art institution. Opening Reception, Saturday, February 11, 2:00-4:00 pm 4th Floor Gallery. The event is free and open to the public. "These collaborative works started out as an experimental conversation between two artists." 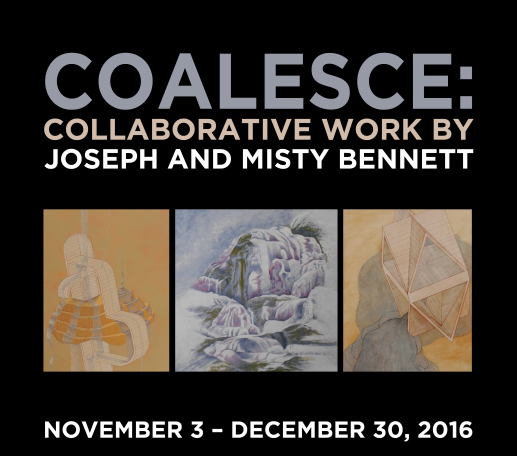 These are the reflective words of artists and University of Montevallo Art Department faculty, Joseph and Misty Bennett. From November 1 through December 30, 2016, the Birmingham Public Library will showcase the work of both artists in the Central Libraryâ€™s Fourth Floor Gallery. A process was developed wherein one artist would begin a drawing, then hand it over to the other, and they would continue to pass it back and forth until both felt there was nothing more to add. It was a reactionary and spontaneous way of working, which led to a sense of discovery and a deeper understanding of self for each artist. Opening Reception, Saturday, November 12, 2:00-4:00 pm 4th Floor Gallery. The event is free and open to the public. This exhibit features recent work by University of Montevallo (UM) Departmetn of Art faculty and graduates. Art is big at Montevallo and the Department of Art is one of the largest departments int he University. With a decdicated full-time faculty of 13 and over 250 art majors, students have the challenges and the resources to achieve at their highest level, and many choose to continue their education in graduate programs across the country. UM offers concentrations in eight different areas, with a faculty director in each area. The exhibit features work by each studio faculty member and by invited alumni fro each area of concentration. This exhibit features the work of ten Alabama artists who are also members of the Watercolor Society of Alabama (WSA). However, the artwork in the exhibit will feature a variety of media including oil, acrylic, collage, watercolor, ceramics, mixed media, hand-painted lithography, and calligraphy. The exhibit is curated by Jaceena Shepard of Town Creek, Alabama, a well-known practicing artist, exhibition curator, and art teacher. Watercolors are not the only media to be featured in the show. The artists show their prowess in a variety of media including oils, acrylic, and sculpture. "These ten artists are enthusiastically creative. Their work is inspiring because it tells a story, makes us smile, asks â€˜how did she do thatâ€™, and causes us to realize that creativity comes from discovering the most potent muse of all is our own inner child," says Shepard. Opening Reception, Sunday, July 10, 2:00-4:30 pm 4th Floor Gallery. The event is free and open to the public. "Everything going forward must be either an elegy (for what we have lost) or a celebration (of what we have left). Or both." Those are the reflective words of Birmingham artist Merrilee Challiss. 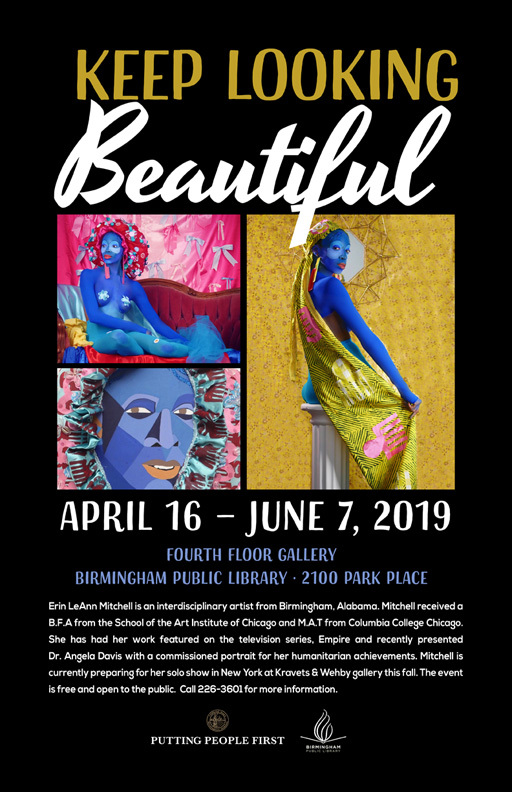 From May 7, 2016 through June 24, 2016, the Birmingham Public Library will showcase the artwork of Merrilee Challiss at the Central Libraryâ€™s Fourth Floor Gallery, 2100 Park Place downtown. Enjoy energetic paintings and mixed media works of a pensive, psychedelic nature. 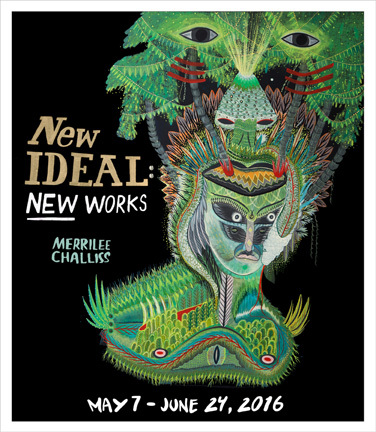 Together these works make up Challiss' New Ideal. "The paintings are failures of my attempts to represent energy and consciousness in its various stages, respective to the subject," she said. "What is left of our world, despite our best efforts to destroy it, is still rife with wonder and beauty, fecundity and meaning. I see all natural systems, man, animal, and spirit as connected and constantly overlapping and co-existing on conscious and unconscious levels. I locate myself and my role as artist, in a meditative state, in the liminal realm between elegy and celebration, where the spirit and the unconscious trump our waking reality." Born in Cleveland, Ohio, Merrilee Challiss is an artist based in Birmingham. She received her Bachelor's in Art from the University of Alabama at Birmingham and Master's in Fine Arts from the Pennsylvania Academy of Fine Arts. In 2015, she did residencies at Signal Fire, Portland, Oregon, and Starry Night Retreat, Truth or Consequences, New Mexico. Opening Reception, Saturday, May 7, 2:00-4:00 pm 4th Floor Gallery. The event is free and open to the public. Alabama's best-known political cartoonist of the twentieth century, the Birmingham News' Charles Brooks drew more than 10,000 editorial cartoons and provided commentary on eight presidential administrations, the Cold War, the civil rights movement, the Vietnam War, and Watergate, as well as state and local politics. In 1998, Brooks donated nearly 4,000 of his original drawings, rendered on 11 x 17-inch sheets, to the Birmingham Public Library. These drawings are now preserved in the library's Department of Archives and Manuscripts and form the basis for this exhibit, highlighting Brooks' work on seven presidential campaigns from John Kennedy's 1960 razor-thin defeat of Richard Nixon to Ronald Reagan's 1984 landslide win over Walter Mondale. The creation of this exhibit was funded by a generous grant from the Birmingham News. 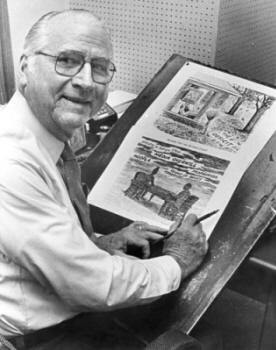 Born in Andalusia, Alabama, Charles Brooks enrolled at Birmingham-Southern College in 1939, applying $200 won in an art contest toward his tuition. As his interest in political cartooning grew, Brooks left Birmingham to study at the Chicago Academy of Fine Arts with Chicago Daily News cartoonist Vaughn Shoemaker, a two-time winner of the Pulitzer Prize. After serving two years in the military during World War II, Brooks worked drawing gag-cartoons for a Chicago advertising agency. In 1948 he returned to Alabama and was hired by the Birmingham News as the paper's first editorial cartoonist. Charles Brooks served as president of the Association of American Editorial Cartoonists (1969-1970) and president of the Birmingham Press Club (1968-1969). The recipient of numerous awards for political cartooning, Brooks' work is featured in more than 50 books, including encyclopedias and textbooks on history, political science, and economics. In addition to two exhibits at the Birmingham Public Library, his cartoons have been exhibited at the White House, the National Portrait Gallery in London, and the Smithsonian Institution. Charles Brooks retired from the News in 1985 and died in 2011. 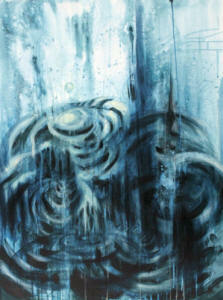 An exhibition showcasing artwork by students in the painting program at the University of Alabama at Birmingham (UAB). This exhibit highlights the diverse work being created at UAB in the painting studio, under the guidance of Professor Gary Chapman. While Chapman teaches a highly structured, somewhat traditional beginning painting class, he then works with each student individually through the intermediate and advanced levels, guiding each studentâ€™s individual research, exploration, and experimentation. The result is a dynamic group of young painters who have each found and developed their unique vision through paint. Opening Reception, November 15, 2:30-5:00 pm 4th Floor Gallery. The event is free and open to the public. Additional information about Andrew Glaze and a bibliography of his work. The Watercolor Society of Alabama Annual Members Showcase display features nearly 60 aqua media works from artists across the state. Don Taylor of Panama City, Florida, is the awards juror. Taylor is past president of the Southern Watercolor Society 2006-2009 and past member of the Board of Directors at the Visual Arts Center of Northwest Florida. His paintings have been accepted in juried shows such as the Adirondacks National Watercolor exhibit (2007, 2012); Allied Artists of America (2007, 2008); 83rd American Artists Professional League Grand National 2011; 79th Hudson Valley Art Association 2010 Exhibit; and the Watercolor Society of Houston. 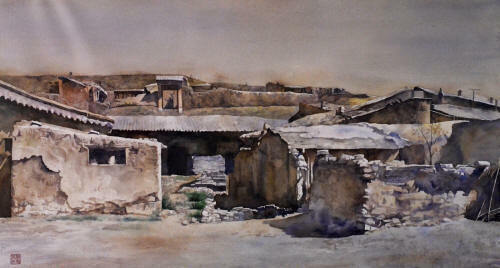 Awards include the Merit Award in the Judith Ryan Williams Annual Nature and Wildlife Exhibit (2011); the San Antonio Watercolor Society Award (2000); and the Jack Richeson Award (2007) in the Southern Watercolor Society annual exhibits. A retired veterinarian, Taylor frequently teaches watercolor workshops. Award ceremony and opening reception, Sunday, September 20, from 2:30 to 4:30 p.m., 4th floor gallery. The event is free and open to the public. To Create. To Desire. To Grow. To Nurture. To Dream. To Inspire. These words are not a slogan; they are the titles of paintings . . . paintings that fluidly progress in color, brushstroke by brushstroke. From July 9, 2015 through September 4, 2015, the Birmingham Public Library will showcase the work of local artist Matthew Mayes in the Central Libraryâ€™s Fourth Floor Gallery. Arresting acrylic paintings bold in color, texture, and depth make up the exhibition Layers of Meaning: Paintings by Matthew Mayes. Born in Florence, Alabama, Matthew Mayes is self-taught with over 12 years of experience as a professional artist. He currently resides in Birmingham with his partner Brian and their son Noah. Mayes began painting as a child after watching the television program "Joy of Painting" with Bob Ross. Mayes experienced a number of stints with hospitalization and home schooling due to illness and needed an outlet for his creativityâ€”art was his answer and it gave his life meaning. "Once, I believed that love, food, and music were the core passions that transcended all race, creed, and color. Now, I know that art encompasses all,â€ he states. Regarding his creative process, Mayes observes, â€œI allow natural ability combined with a trained eye to create. Without both, my art could not exist." A maze-like betta fish drawing produced with a single continuous line that never crosses itself. An illustration of a homeless man, fashioned with an elephant-god head. An abstract painting of Alabama, constructed entirely from recycled materials. 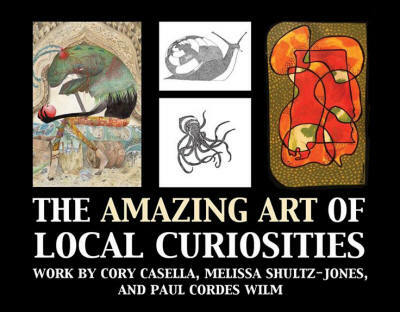 Cory Casella, Melissa Shultz-Jones, and Paul Cordes Wilm are Birmingham artists with very unique perspectives. Cora Casella Drawing Workshop. On Saturday, June 6, from 10:00 a.m. to 12:00 p.m., Casella will share his technique of drawing in pen with one continuous line. The event will be held in the Story Castle, 2nd Floor at the Central Library. Registration requested; call 226-3670. Hero Art Drawing workshop with Melissa-Shultz-Jones. On Wednesday June 16 from 6:00 to 7:30 p.m., Shultz-Jones will lead a Hero Art session for children and accompanying adult family members in the Story Castle. Registration requested; call 226-3655. Registration is required. Email paperworkerslocal@gmail.com or visit paperworkerslocal.blogspot.com for information. Artist Statement: My work can be described formally as atmospheric and architectural. At times, the ambiguous interior and exterior environments border on sterile. However, in nature, calm is always disrupted by conflict either from internal or external sources. Some are real while other exist only in our psyche. Multiple conflicts often exist at once, and the ultimate goal becomes to escape to an alternate state of mind. In my drawings, architectural forms reference both the stability and instability of identity. Forces of nature, like water and wind, invade and sometimes destroy, serving as a metaphor for the evolving self. Artist Bio: Bryce Speed was born in Mississippi and graduated with an MFA in painting and drawing from the University of Alabama. He completed a residency at the Kimmel Harding Nelson Center of the Arts in Nebraska City and taught at Omaha Metro Community College, the University of Nebraska at Omaha, and Central Community College in Columbus, NE. In 213 he began teaching at the University of Alabama. Speed's work has been included in numerous exhibitions in several sates. In 2006 and 2011, his works were selected for publication in Vols. 64 and 69 of New American Paintings. Bryce's work was featured at the PS122 Gallery in New York City in 2009, and in 2011 his works on paper were exhibited as part of the Nebraska Arts Council's Nebraska Governor's Residence Exhibition Program and at the Museum of Nebraska Art. Moodyâ€™s sixty-five watercolors explore downtown Birmingham, Southside, Five Points, Highland Avenue, Forest Park, and Redmont, capturing the beauty and vitality of some of the cityâ€™s landmarks and districts. Nearly 60 aqua media works from across the state are on display September 21â€“October 31 during the 2014 Watercolor Society of Alabama Annual Members' Showcase at the Central Library. Steve Rogers of Ormond Beach, Florida is the awards juror. His artwork has won international awards. He was the Purchase Award Winner of the 2006 National Watercolor Society â€œBest of Show.â€ His paintings have won four awards in the American Watercolor Society Annual International Exhibitions. He graduated with a Bachelor of Arts degree from Monmouth College in Monmouth, Ill.
"Every Line Tells a Story"
Linoleum block relief prints selected from the portfolio of Debra Eubanks Riffe. Prints created and hand pressed from 2004 thru June 2014. 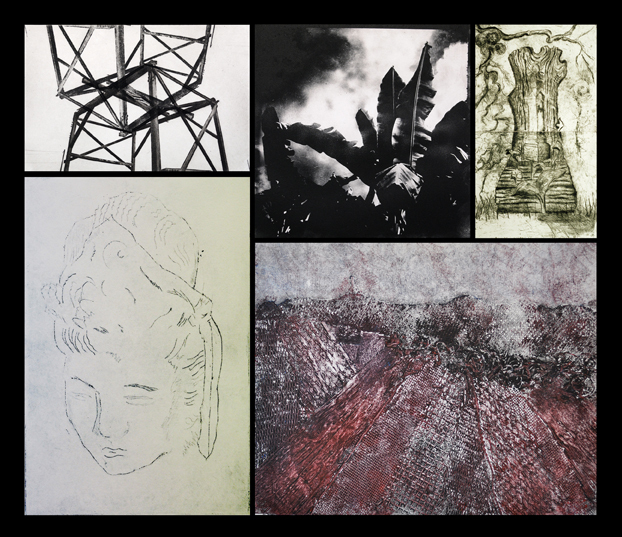 Artist's Statement: "I enjoy the versatility and the immediacy of drawing with a pencil and the physicality of turning the wheel of a printing press. Through simplicity of form, I use basic art principles to convey shape, gesture, attitude, movement and emotion. My compositions are, exclusively, images of African Americans placed in rural southern surroundings, performing routine tasks in timeless, solitary reflective moments. These tasks speak of social status and identity; intimacy and a sense of place. I appreciate the ordinary and I try to record details, within each print, that will stir an emotion the viewer might respond to. Iâ€™m not opposed to using a color palette, however, I canâ€™t deny that I enjoy the challenge of printing with a rich, black oil-based ink. The contrast of sharp modulating lines on bright white paper gives each print an infinite range of tonal variations and textures." 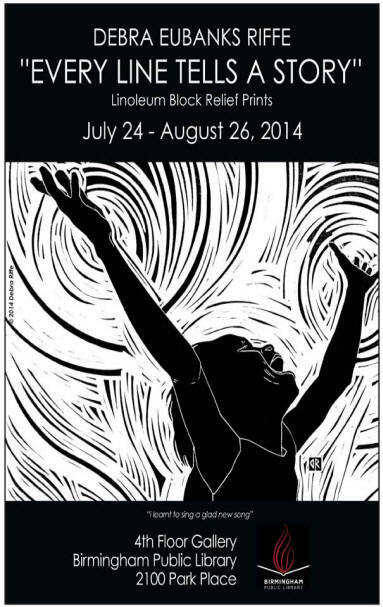 Birmingham Art Crawl, Thursday, Aug. 7, 5 to 9 p.m., in the 4th Floor Gallery. Riffe will be one of several artists to display works at downtown Birmingham businesses. Free. Starr Weems enjoys designing colorful, dreamlike paintings with watercolor using an unusual process which consists of layering drawing gum and transparent color to build high-contrast images. 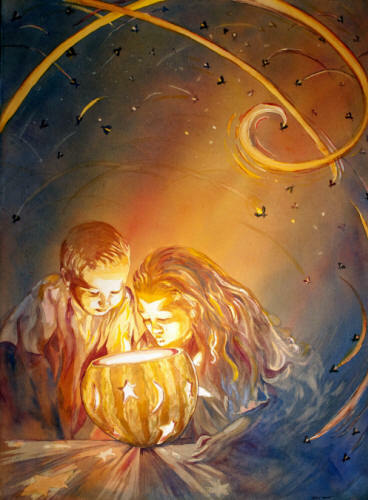 She enjoys "making art that represents the collision of reality and the fanciful world of dreams. Watercolor Workshop With Starr Weems: Sunday, March 30, 2:30-5:30 p.m., Second Floor Story Castle, Free. Call 205-226-3670 to reserve a spot. Once Joyce E. Brooks managed to minimize the overload, achieve balance and gain some much deserved peace, she discovered a hidden gift deep inside of her. Joyce had never given any thought to becoming an artist. In 2010, after attending an event that included painting on canvass for entertainment, she stumbled upon a new passion. She began painting with acrylics and hasnâ€™t stopped. Joyce E. Brooks is also the author of the book titled Self-Inflicted Overload. 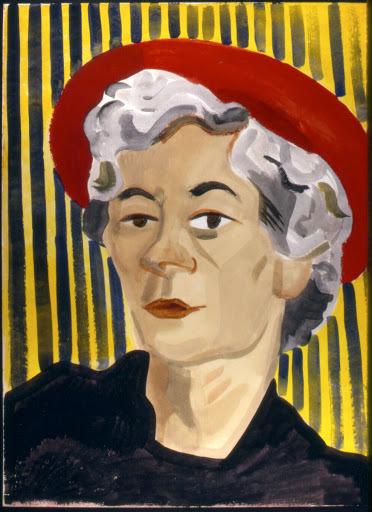 The exhibit Ladies, Gentlemen and Bazards: The Art of Lois Wilson features a little known Alabama artist who died in 1980. The focus is on Wilsonâ€™s â€œfound artâ€ where she used wood that she scavenged from demolition sites, parts of furniture that she disassembled, old brushes, ironing boards, toilet seats and left over food for coloring. Wilson took the trash that other people discarded and used it to create art. The art illustrates the issues that were important to Wilson: environmentalism and conservation, racism, spiritualism, the needs of the aged and homeless, and the emptiness of modern American materialism. Heart Gallery Alabama (HGA) is a state wide non-profit agency whose mission is to help find forever families for Alabama's foster children. There are more than 300 children at any one time, who have no identified resource for a permanent home and family of their own, and these are the children for whom HGA recruits. 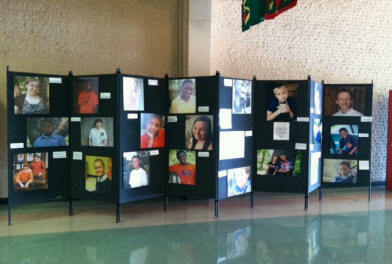 They recruit professional photographers to volunteer to take the Children's portraits, and then take these professional grade photographs around the state to museums, malls, galleries, libraries, and other locations in order to increase awareness of the need for foster and adoptive families in the state of Alabama. Operating for almost eight years, they have been very successful in finding forever families for over 450 children statewide. As November is National Adoption Month, this is timely. The exhibit is located on the 1st Floor Gallery of the Central Library during regular business hours. This reception and information session will provide instruction on adoption in the state of Alabama and introduce some of children still hoping to be adopted as well as a few of the over 450 children successfully placed with Forever Families. The Watercolor Society of Alabama Annual Members' Showcase features aqua media paintings executed by watercolorists from across Alabama. This exhibit features 41 pictures that capture the suspense, drama, tension, struggle and triumph of the civil rights movement in Birmingham during the 1950s and 1960s. Photographers with The Birmingham News took the photos, which highlight freedom riders, sit-ins, the Children's Crusade of 1963, the impact of the bombing of Sixteenth Street Baptist Church and more. Courageous leaders such as the Rev. Fred Shuttlesworth, Dr. Martin Luther King Jr. and others are featured in the exhibit. "You may have seen some of these photos in the past but the detailed captions next to each photo help you understand the full story and the achievements of the Birmingham movement,'' said Marjorie White, president of the Birmingham Historical Society. 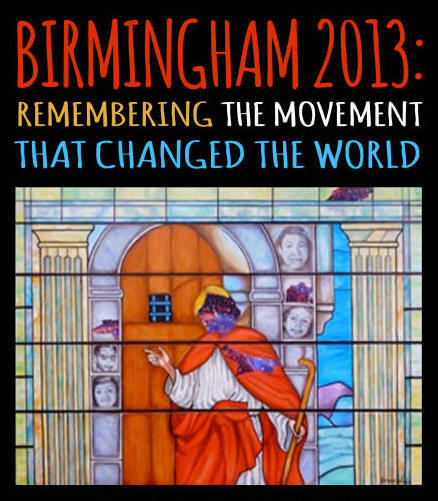 The Birmingham Historical Society organized the exhibition. Shineman has shown in various galleries, museums, and art shows around the country including the Alabama State Council on the Arts Gallery in Montgomery and the SICA 7th Annual International Exhibition at the Shore Institute of Contemporary Arts in Long Branch, New Jersey. 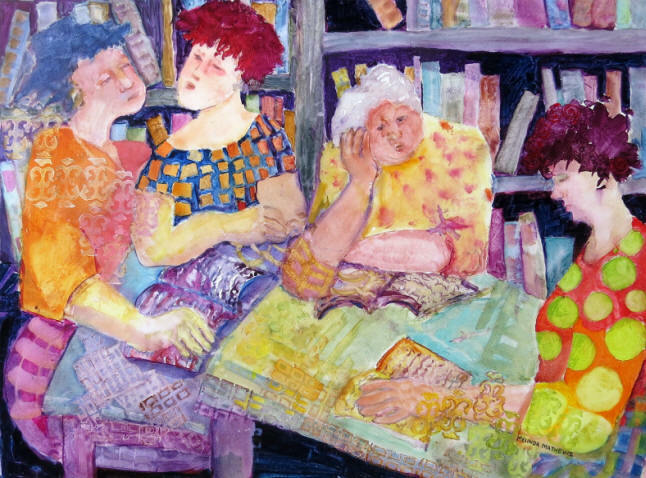 Her many honors include the University of Alabama Research Grants Committee Award for a project titled Personal Modernism: Relating Through Painting (2012) and the Best in Show Purchase Award at the 26th Annual West Alabama Juried Show (2010). The sculptural work of Charles Clary and Jamey Grimes will intrigue, fascinate, and challenge viewers. It is an exhibition unlike anything shown at the Birmingham Public Library (BPL) before. The artwork may resemble objects seen in nature, yet they are fictional fabrications born of the artistsâ€™ imagination. The exhibit is located in the 4th Floor Gallery of the Central Library during regular business hours. 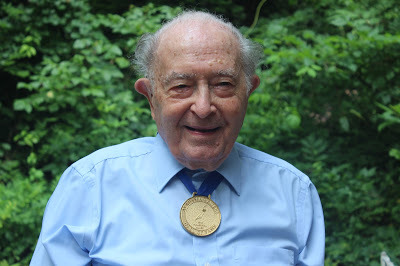 Art Bacon is known by many as an artist, educator, and scientist. However, art has always been his passion. He was born in West Palm Beach but lived in several places in and outside of Florida. Recognized early for his artistic talent, he won many prizes and awards long before he graduated from high school. Now retired from Talladega College where he was named Professor Emeritus of Natural Sciences and Humanities, he is painting more than ever and occasionally writes and recites poetry. People are Baconâ€™s subjects of choice especially older and neglected people whose experiences show in their faces. In the early days, he worked almost exclusively with ink washes and linesâ€”very little color. He was a minimalist and believed that color interfered with his expression of feelings. Bacon now uses more color and acrylics and a number of other media and techniques, often combining several. However, he still likes lines and his palette is still limited. A leading art critic describes Baconâ€™s work as â€œsocial commentary with a bold vitality.â€ Works by Bacon can be found in many private collections including those owned by Bill Cosby, U.S. Congressman John Lewis, and Hank Thomas. Institutions owning pieces by the artist include Alabama State University, Birmingham Civil Rights Institute, Mobile Museum of Art, Heritage Hall Museum, University of Maryland, Comer Museum, and Opryland. He has been featured in Southern Living and Lakeside magazines, Black Art in America, an online journal, and other publications. Meroâ€™e Rei had an interest in art from an early age and began producing works of art as a teenager. His love for jazz, blues and gospel serves as the inspiration for many of his pieces. His interest in African cave and rock art has inspired his later works. 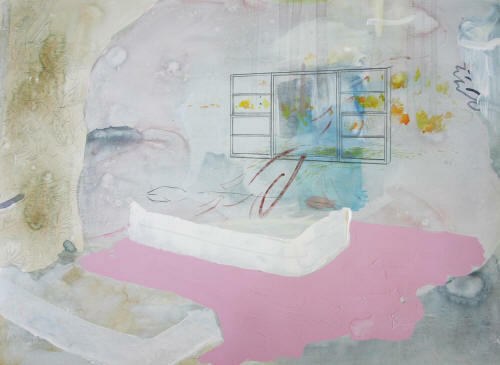 Rei has shown extensively in both solo and group exhibitions. Rei is a native of the southern region of Alabama near Mobile. He graduated from high school in Birmingham, Alabama then attended the University of Alabama where he studied ceramics, sculpture, and print-making. He later received his B.A. at the State University of New York. Rei retired from the Office of Personnel Management of the United States Federal Government. He also served in the United States Navy as a medical corpsman. He gave many years as a clergyman in the Alabama West Florida Conference of the United Methodist Church. In his spare time, he studied art in galleries and museums in Spain and the Middle East. To purchase prints of the artistâ€™s paintings, go to: 2-meroe-rei.fineartamerica.com. 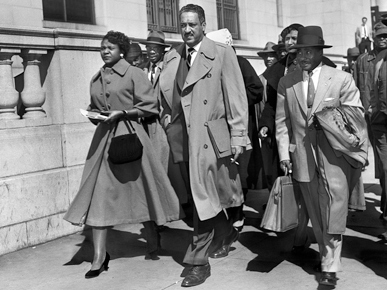 From left, Autherine Lucy, Thurgood Marshall and Arthur Shores, exit the federal courthouse in Birmingham, Ala. in February 1956, following Lucy's reinstatement as the first black person to be admitted to the University of Alabama. Photo credit: Courtesy of The Birmingham News. The Birmingham Historical Society and the Birmingham Public Library are showcasing the life and times of Birmingham civil rights attorney Arthur Shores in a special exhibit. The exhibit features a scrapbook of newspaper reports and printed materials, which Shores collected throughout his legal and political career. The Birmingham Historical Society has copied numerous pages of the scrapbook, which is larger than the size of a newspaper, in order to display them in the downtown library's fourth floor gallery. Shores, who was born in 1904, was a high school principal at Dunbar High School in Bessemer, Ala. when he became a lawyer in 1937. Although Shores died in 1996 at the age of 92, the scrapbook and exhibit look at his career from 1939 to 1975. Shores' daughters, Helen Shores Lee and Barbara Sylvia Shores, have written a book about their father. During the Nov. 4 opening reception, they will sign copies of The Gentle Giant of Dynamite Hill - The Untold Story of Arthur D. Shores and His Family's Fight for Civil Rights. They wrote the book with Denise George. Helen Shores Lee is a Jefferson County circuit judge and Barbara Sylvia Shores is director of the Jefferson County Office of Senior Citizens Services. Both say they are humbled that an exhibit features their father, who fought for voting rights, housing issues, educational opportunities and more. "I'm sure if he were here, he'd be very pleased that there is a recognition of his work,'' says Helen Shores Lee. Interview of Arthur Shores' daughters, Helen Shores Lee and Barbara Sylvia Shores discussing their father and the scrapbook. Credit: Bernard Troncale. 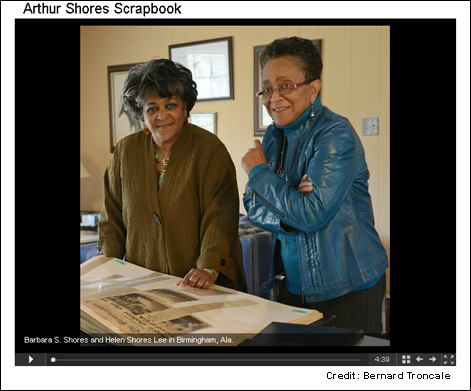 "Civil rights attorney Arthur Shores' life told by daughters in new book" Birmingham News article. In the early twentieth century, posing for a photographic portrait was an event -it was an opportunity for people to make meaningful visual statements about themselves, their families, and their communities. Those living in Fayette County, Alabama, and the surrounding area did not need to travel to a photo studio to have their picture taken. Instead, they could simply visit the Shackelford family. Mitch and Geneva Shackelford, along with their children, were multi-talented African American artists who played a central role in the rural Fayette County community of Covin. Though farming was their primary vocation, the Shackelfords were also commercial photographers who left behind a collection of more than 850 glass-plate negatives that are now preserved in the Birmingham Public Library Archives. The Shackelfords photographed local residents and visiting travelers, taking pictures of individuals, families, school groups, and civic organizations. In an era when demeaning and stereotypical depictions of blacks were prevalent in the United States, the Shackelfords provided African Americans with a vehicle for self-representation. The Shackelford photographs offer a dynamic and rarely seen depiction of the African American experience in rural Alabama and show black people living full and vibrant lives in the face of the racial and socioeconomic oppression of the Jim Crow era. This exhibition offers a glimpse into life on both sides of the lens, telling the story of these remarkable photographers and those who stepped in front of their camera.